This modern boutique-style hotel soars 44 stories above Times Square and features 460 oversized accommodations including two suites. The hotel is just steps from Broadway theaters, Restaurant Row and an endless array of popular attractions. Guests can indulge at Restaurant Above, perched 21 stories above Times Square, for breakfast, lunch and pre-theater dining. 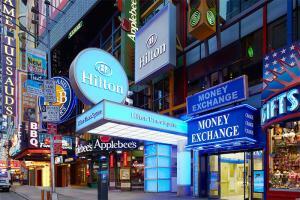 Located in Times Square, about 9 miles from La Guardia Airpot and 18 miles from John F. Kennedy International Airport. Pinnacle Bar, Restaurant Above - American cuisine.